What’s the Best Outdoor Spa in 2017? Though a lot of people are in the market for an inflatable hot tub, few are looking for one to use indoors. The main reason? Space. It can be hard to find a place in your house that will fit an entire spa, inflatable or otherwise. So, for most people, a hot tub that can be used outside is the perfect choice. 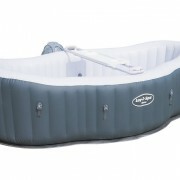 But, while almost all inflatable spas can be set up outside, which are the best for outdoor use? Which will last the longest? 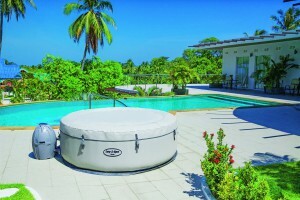 We’ve compiled a list of the best options in outdoor inflatable hot tubs, so that you can choose which best suits you. 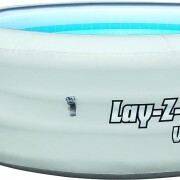 When looking for comfort, as well as durability, in a spa, then you’ll need to look no further than the Lay-Z-Spa Vegas. This inflatable spa, voted the UK’s bestselling hot tub of 2013, is a great choice in outdoor hot tubs. Able to sit as many as six adults comfortably, it is perfect for a small get-together with friends, or for use as a family activity. Like all Lay-Z-Spa products, it comes with all the luxuries you could want. There is a Lay-Z-Massage Jet System, to provide perfect counter pressure to ease your muscles after a long, tiring day. The water can be heated to a blissful 40 degrees Celsius, so that you can keep warm in the bubbly water. The inflatable inner lid is a perfect accessory for an outdoor spa, because it can help your water retain that temperature, so that you can soak whenever you please, at a moment’s notice. The Vegas also comes with everything that you’ll need to set it up, which you can do in as little as ten minutes. This includes a chemical floater, two charcoal filter cartridges, a heater pump, and a setup DVD. 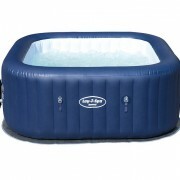 To further its suitability for outdoor use, the Lay-Z-Spa Vegas also comes with a leatheroid spa cover, an inflatable spa lid, and a leatheroid lid cover. This will help keep your water clean and free of debris that can be found outside, and it will keep your water at the perfect temperature. If durability and a traditional spa-like feel are what’s important to you in choosing an inflatable hot tub, then you’ll want to consider the Lay-Z-Spa Palm Springs. This model is built the most like a permanent hot tub, and offers the same luxuries as one, as well. The amenities it offers are certainly not lacking, especially for a portable hot tub. There is a Lay-Z-Massage System, which has 120 air jets circling the inside of the spa for the perfect bubbly experience again and again. It can also heat the water up to 40 degrees Celsius, an excellent soaking temperature that helps promote relaxation. It also offers the rather unique option of pre-programming your spa, allowing you to plan your soaks ahead of time, so that your warm water will be waiting for you. The Lay-Z-Spa Palm Springs is probably the most durable option on this list. It is built in three individual layers, so that it can stand up to wind, rain, and other elements. This is referred to as TriTechTM. Items with TriTechTM manufacturing are made to be practically puncture proof, which is an excellent option for those who don’t have a poured concrete base ready and will have to place it in their backyard. This triple layer system also offers extra comfort and support to you. The Palm Springs also comes with a spa cover, protecting your water from debris and keeping it warm. Do you want a bit more out of your new spa than the standard bubbles and heat? Is your hot tub going to be the new star of your backyard bashes? Then you’ll enjoy the Lay-Z-Spa Paris! 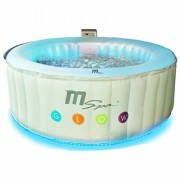 This inflatable spa, besides being crafted by the UK’s most trusted inflatable hot tub company, is the brand’s first tub that comes with color-changing LED lights inside of the spa! This brings a new, fun atmosphere to your private soaks, a romantic setting to your dips for two, or a “party!” feeling to your next gathering. This is especially nice outdoors, where you can light up the night! These lights have seven different color options, and can be changed using the included remote. But that isn’t the only feature of the Paris; it isn’t lacking in comfort and convenience. This tub boasts an AirJet Massage System that comes with 87 jets that will ease stressed muscles and stressed minds alike. The water can be heated to 40 degrees Celsius, and will heat very quickly, making it perfect for outdoors. No more standing around in your swimsuit forever, waiting for the water to heat! It also has very sturdy construction. 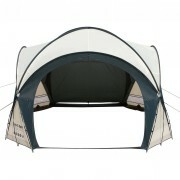 It comes with an I-beam construction and floor cushions, making it both comfortable and sturdy. Are you intending to throw huge parties in your hot tub? Or maybe you just have a big family, and enjoy a good, long soak together? If either is true, then you’ll want to consider purchasing the Lay-Z-Spa Monaco. Made by Lay-Z-Spa, the UK’s most trusted makers of inflatable spas, it’s one of the largest inflatable hot tubs on the market, easily holding as many as eight adults at a time. It comes packed and primed for relaxation. There is a Lay-Z-Massage Jet System, to provide you with the best massage to be found in a non-permanent tub. This system has 80 jets, for all-around reach. You’ll never be out of range of a jet! The water can also be heated to a toasty 40 degrees Celsius via the included heat pump. The heat can be readily controlled by the digital pump, while the jets can be controlled by a digital control panel of their own. It makes adjusting everything to your desire a snap! This is a very durable hot tub. It has a thick outer shell, which offers protection from the elements and from accidental damage. This is important in a tub that is expected to handle a large group of people. It also comes with a leatheroid spa cover and hard wearing clips. This will keep bugs and debris out of your water, keeping it clean and ready for your next use.